I took the 640-822 ICND1, CCENT exam yesterday (on my birthday, woot!) and passed, with authority! I have been sailing around on cloud 9 since then. 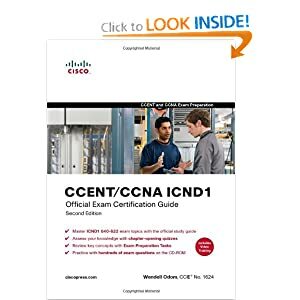 Now onto the ICND2 exam/CCNA certification! update: completed all chapters by last night exam except the Exam Prep, which is reserved for today. For some reason the following commands will not stick in my head, most likely because I have not used them much. I spent the weekend with the OSI model, fun stuff amirite? I am down to the last 2 weeks before the icnd1 exam so spending time memorizing the terminology is eating up most of my time. At this point I can configure a router in my sleep and the only thing that seems to be hanging me up are the tiny details in the Transport, Network and Data Link layers. The ciscopress book does a fairly good job going extremely in-depth into each layer. Even beyond what I imagine the scope of the exam goes to. My ICND1 Official Exam Certification Guide was delivered today, thanks UPS. I had been studying for the ICND1 640-822 exam via CBTnuggets.com and a few study practice tests I found on the interwebs. After realizing that CBT Nuggets was missing a few things (like RIP version 2) I began to get worried that I may be missing additional information found on the test so I picked up the office exam guide from Cisco to help seal the deal. Anyway, I spent the night reading through the chapter on routing protocols and “forced” myself to setup the network configurations from the chapter inside of packet tracer (thanks cisco netacad!). I am feeling fairly good about the routing section of the exam, we’ll see if the information sticks on exam day. Which of the following routing protocols are classless?